Proning - Getting Down on It! Proning Techniques - Getting Down on It! Butterfly photography can be a very rewarding hobby where a photographer enjoys hunting, stalking and then 'shooting' his/her prey. The outcome of a beautiful butterfly photo on the sensor of the camera or viewing it on a PC monitor at home often makes it worth the while of tolerating a bit of inconvenience and hard work out in the field. 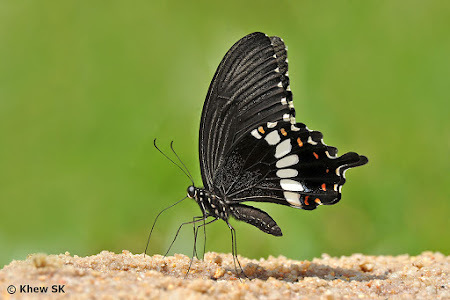 A butterfly photographer should have no lofty expectations of getting a NatGeo quality shot or a rare species each time he/she sets off on an outing. 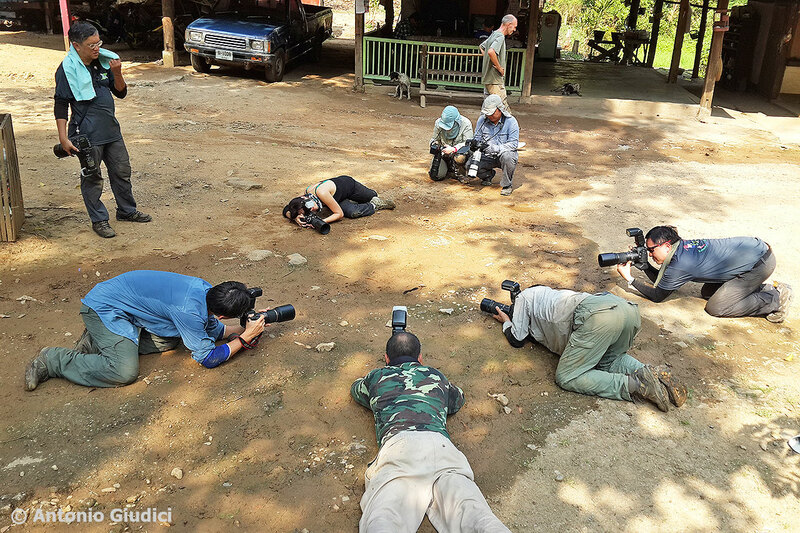 This is the "fun" of the hobby - that one can never predict for sure, what one will get at the end of a day out in the field. A lot of what ends up on the memory cards of a photographer's camera depends on choosing the right spots to look for butterflies, a little bit of skill in approaching the subject, an aesthetic eye, technical competency in handling the equipment and a large dose of luck! 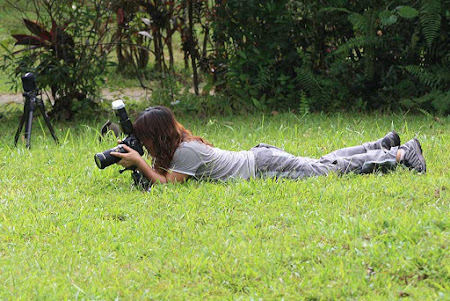 With a bit of experience in the field, the butterfly photographer will know when to chase a butterfly, and when to leave it alone and find an easier target. 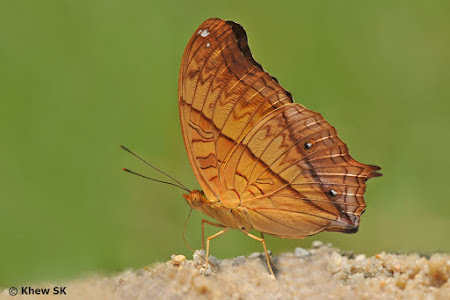 A restless fluttering butterfly or a skittish one can often test one's patience to the limit. As the photographer's learning journey continues, he/she will come to be aware of the surroundings and behaviour of different species of butterflies in different habitats that offer the best chance of landing a good shot. Very often, the challenge of locating, spotting, stalking and ensuring the butterfly stays still for a good shot can be quite tiring (and maybe even demoralising) for the photographer. 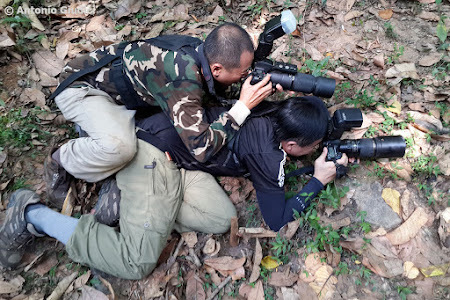 However, it is also the thrill of the "hunt" that motivates many butterfly photographers to continue going out again and again in their quest for the "perfect" shot of a butterfly. 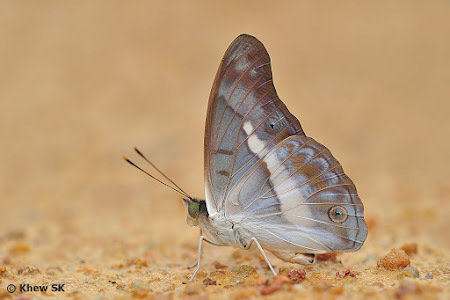 Hence it is quite important to even the odds by observing the behaviour of butterflies, and learning under which circumstances or situations when the butterfly is distracted or stops longer for a chance to photograph it. 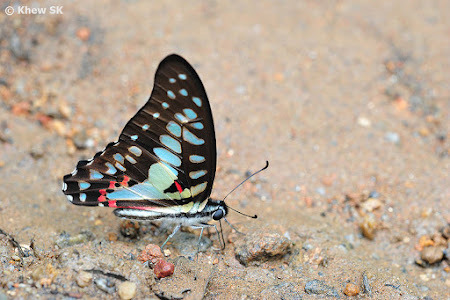 One such situation is when a butterfly stops to mud-puddle (or just simply puddling). 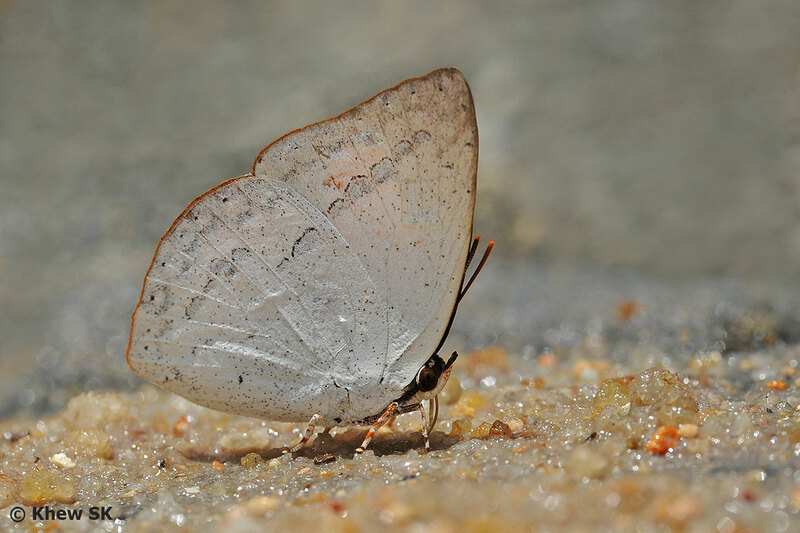 This is where a butterfly is observed feeding at moist forest paths or sandy streambanks that may be contaminated with animal excretions or decomposing organic matter. This week's blogpost discusses how some butterfly photographers deal with puddling butterflies. In the majority of cases, the butterfly is at ground level whilst it is puddling - whether along muddy forest paths or the banks of streams. 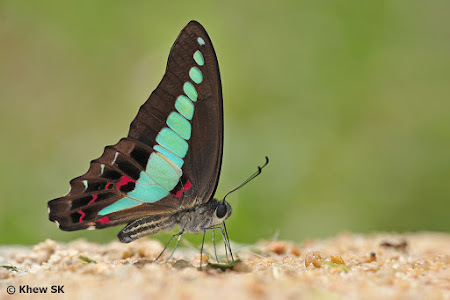 For photographers using DSLRs and use the standard optical viewfinder to frame their shots, it would mean that, to get to the eye level of the butterfly, the camera has to literally sit on the ground. An example of a puddling butterfly taken from a high angle. 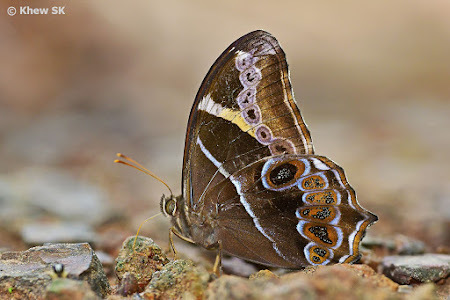 Note that although the focus is on the butterfly's eye and it is sharp, the apical area of the forewing is out of focus as there is not enough depth of field to get the eye and the wingtip sharp at the same time. 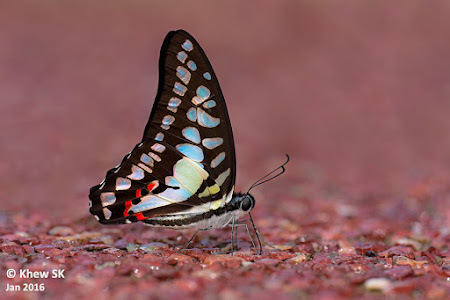 Also, a puddling butterfly with its wings folded upright presents a two-dimensional object and shooting at it from a higher angle may mean that there will be parts of the butterfly that are out of focus due to the shallow depth of field. Hence to get parallel to plane of the butterfly's wings, the photographer needs to get down to the lowest angle possible, i.e. 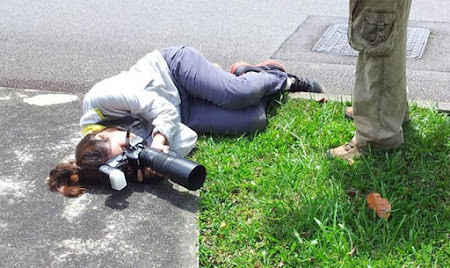 flat on the ground. Some DSLRs with flip-screen backs may solve part of the problem, and the DSLR can sit on the ground whilst the photographer can compose using the preview screen. 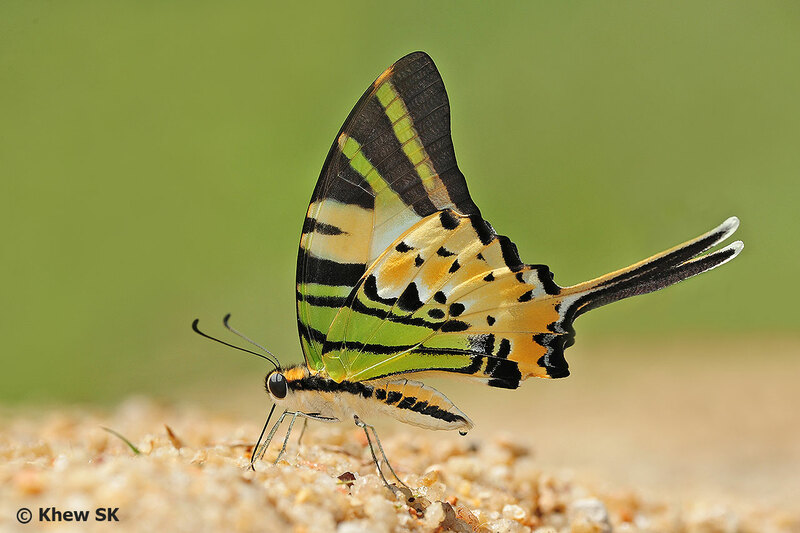 However, it may not be the most convenient means of photographing the butterfly, especially on a bright sunny day. 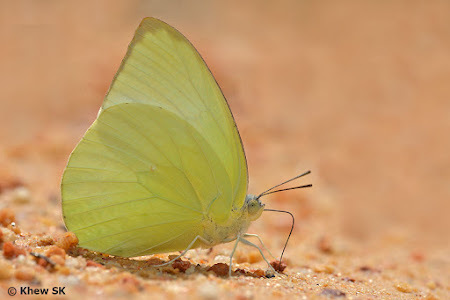 In trying to get to an angle parallel to the butterfly, many photographers use their own techniques of getting down to the eye-level of the subject. 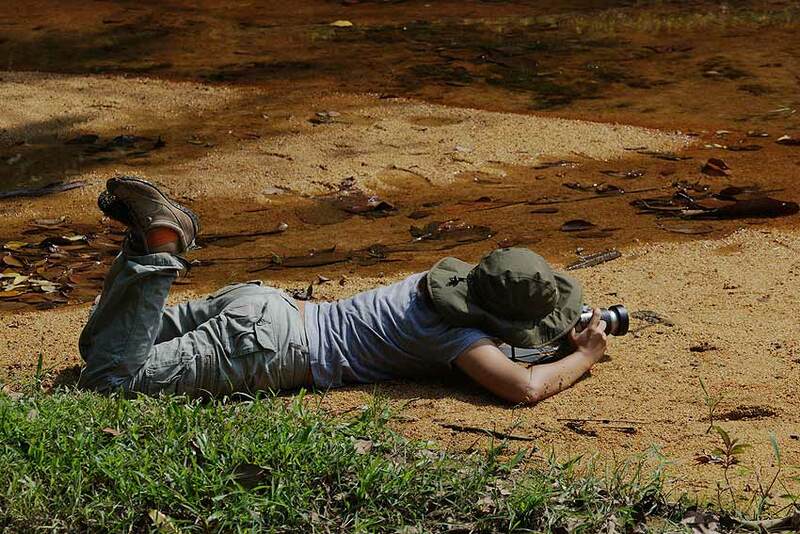 Over the years, we have collected many candid shots of our photographers at work, using their favourite pose for proning on the ground to capture their best shots of puddling butterflies. These vary from horizontal 'planking' positions to yoga poses and contortionist postures that defy gravity. When the best angle to get a puddling butterfly is from the stream, you get INTO the water to get your shot! 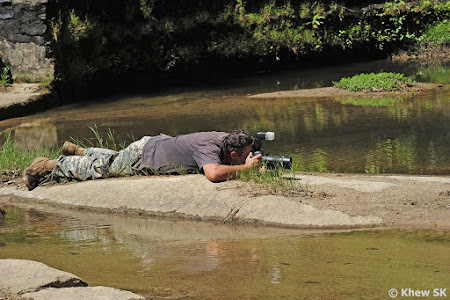 At times, when the puddling butterfly is next to a stream and the best position to photograph the butterfly is from the middle of the stream, then a photographer who is tenacious and determined to get his/her shot ends up in the water! At times, watching a butterfly photographer at work can be quite amusing, and to the ordinary observer, a most inadequate cause for suffering such agony just to get a photograph of a butterfly! When there isn't enough space to prone on the ground to get your shot and another photographer is in the way, then you prone ON the other photographer! 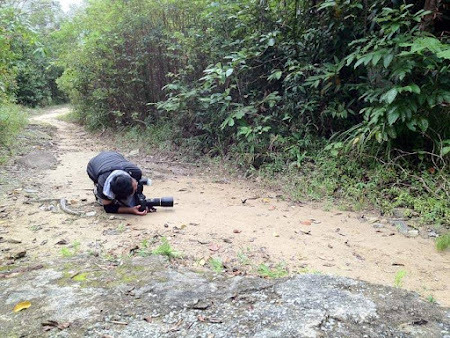 Proning on damp and muddy forest tracks to shoot butterflies may not be the most hygienic nor the cleanest of ways to get a good shot of a butterfly, but photographers will improvise and make the best out of the situation. When placing the DSLR on the ground it is good to remember to switch off the vibration reduction function on your lens or camera. 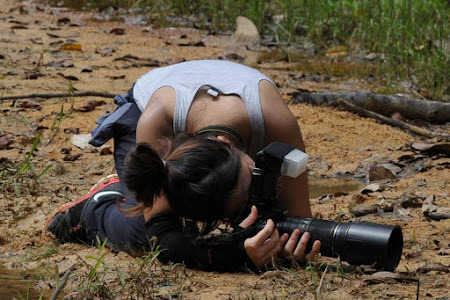 This is because the gyroscopic compensation afforded by the OS/VR/IS/etc system sometimes overrides a stable camera and you may end up with an out of focus shot instead. 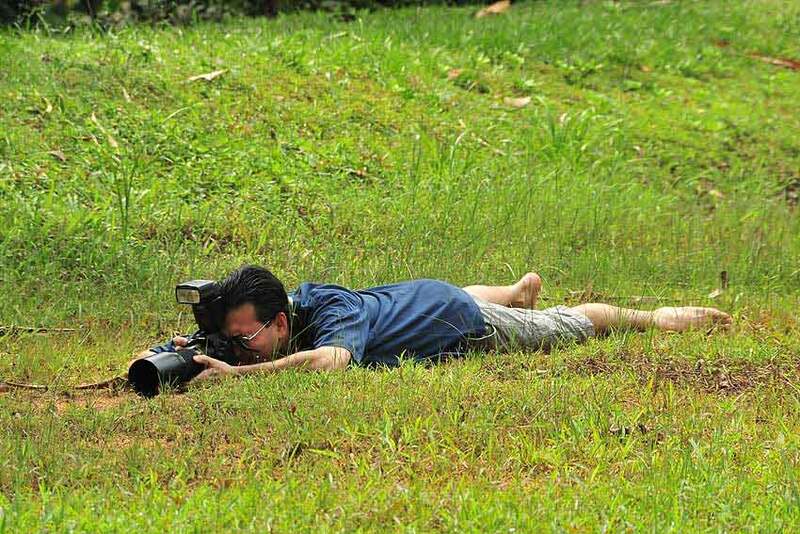 It is not often convenient to find nice flat ground to prone for a low-angled shot. So make do with whatever space you have and go low! 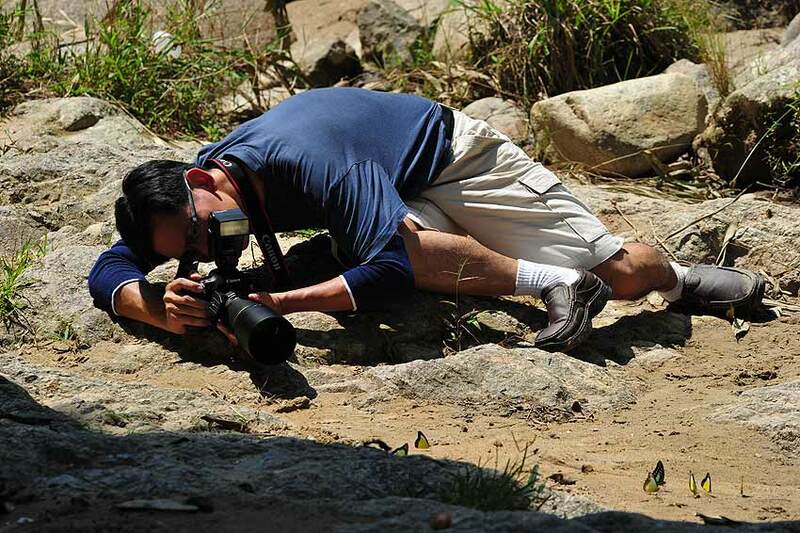 For areas with sharp gravel, broken glass and other injury-causing material, a butterfly photographer should also invest in good elbow and knee-protection gear to minimise any wounds or cuts that he/she may get from proning on such hostile ground conditions. 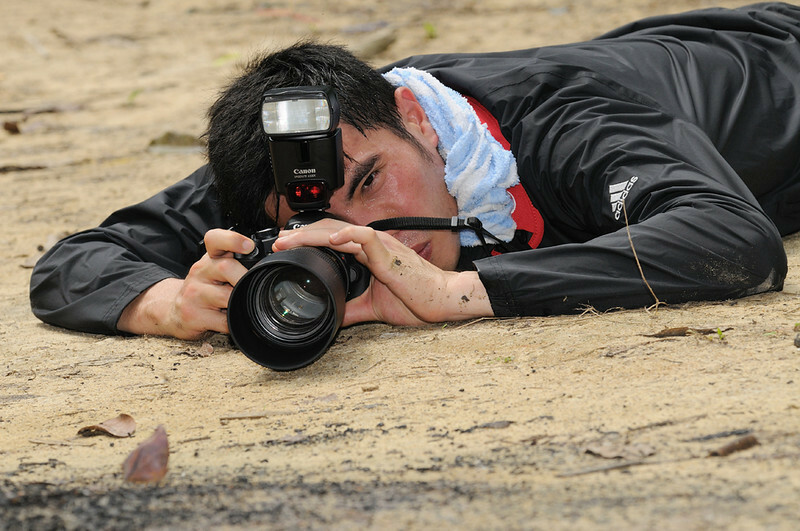 Proning on a gravel road won't exactly give you baby smooth skin on your elbows! 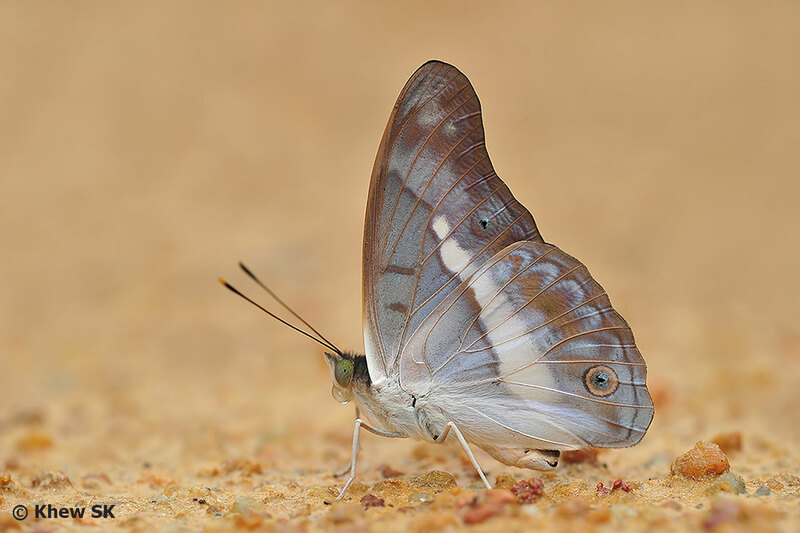 Once you are able to get in plane with the wings of the butterfly when proning, it is possible to open up the aperture to get a smooth and pleasing out-of-focus background, whilst the subject butterfly is in sharp focus. 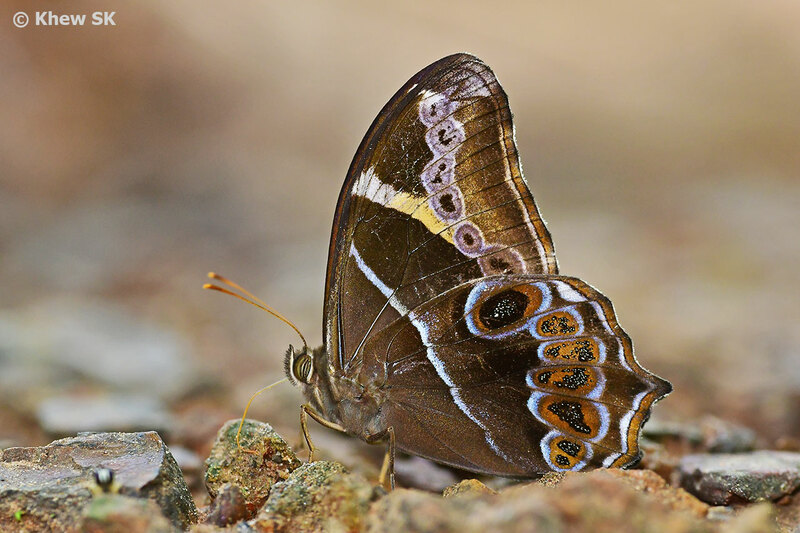 Apertures of f/5.6 or even bigger are possible if the conditions are right. 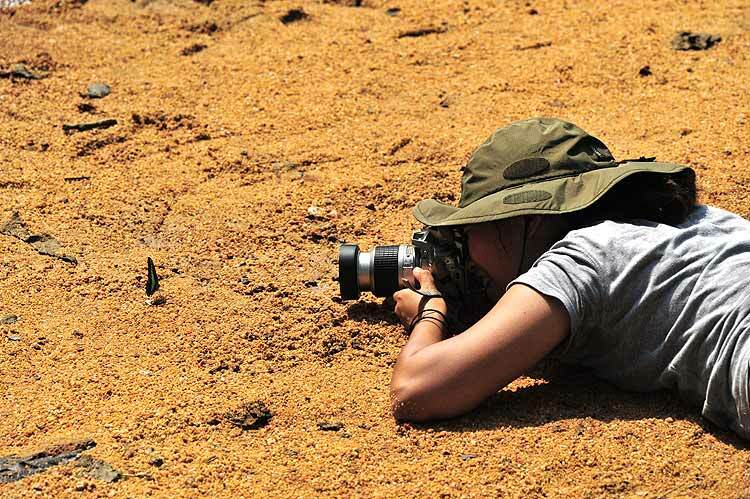 And so, with the examples of how ButterflyCircle's photographers "get down on it" when shooting puddling butterflies, you can try out your own techniques and poses to get the best shot of a butterfly at 'ground zero'! 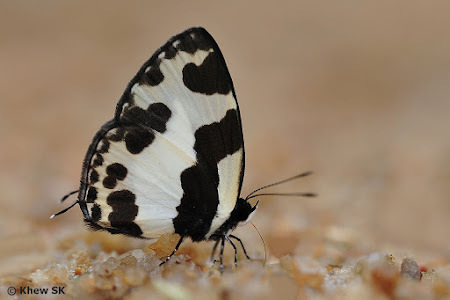 Special thanks to all my ButterflyCircle friends who have been shooting puddling butterflies over the years on our numerous outings. Whilst the identities of the photographers are not obvious in these photos, you know you who are!